The sun may be out but don’t be fooled into thinking conditions are safe, Auckland’s rock fishing safety task force warns fishers as they head out to take advantage of the long weekend and break in the weather to go fishing at their favourite west coast spot. 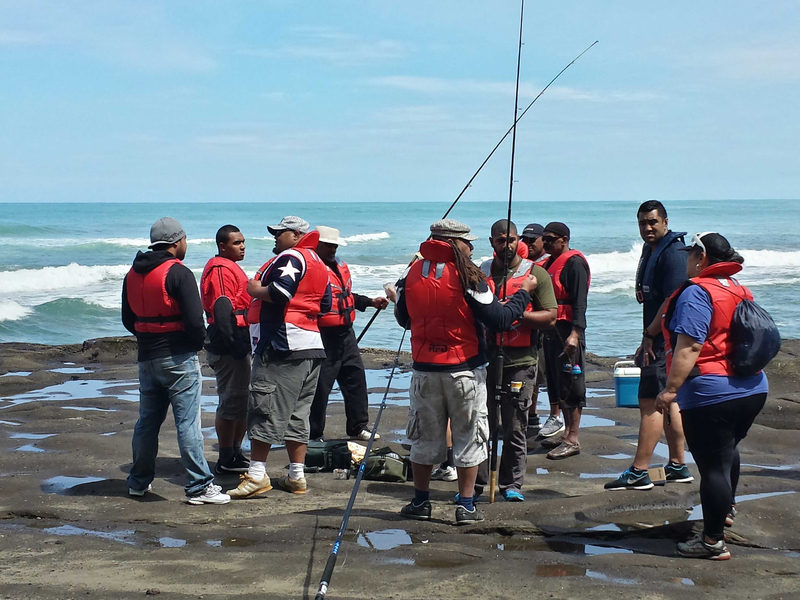 “We appeal also to the families of the [mainly] men who fish off the rocks to urge their fathers, husbands and sons to act responsibly, especially around wearing a lifejacket, so they get home safely at the end of the day,” says Davin Bray, Chief Executive, Drowning Prevention Auckland. There remains a significant risk attached to west coast rock fishing, a risk that is heightened when a big surf is running, all it takes is one rogue wave to dislodge a person, says Surf Life Saving Northern Region Operations Manager Adam Wooler. “Wearing a lifejacket may mean the difference between life and death, and every incident on the rocks doesn’t just put the person in the water at risk – it also poses a risk to others trying to assist them, including our lifeguards,” he says. The arrival of summer and holidays has seen a surge in numbers fishing off the rocks and the task force has been carrying out campaign activities to raise awareness about the risks involved, including Rock Fishing Safety Advisor ‘Rockman’ Sam Turbott who, along with jet ski driver Willy Goer, cruises the coastline gathering data on fisher activity, surveying fishers and passing on valuable safety advice. “Thanks to the support of Dunedin company TracPlus who loaned us a GPS tracking device, we are able to geo-reference the rock fishing hotspots and help keep Sam safe by knowing where he is at all times,” says Adam. Drowning Prevention Auckland, Surf Life Saving Northern Region and Auckland Council are partners in a joint task force aimed at reducing fatalities among the fisher population on Auckland’s unpredictable and wild west coast. “Our joint campaign has made a significant impact on reducing the number of drownings and influencing behaviour change. However, there is more work to do as some fishers continue to place themselves at risk by choosing not to wear a lifejacket, which could ultimately save their life. The west coast is a dynamic environment that requires respect in order to stay safe,” says Auckland Council’s Parks, Sports & Recreation Manager Mace Ward. The West Coast Rock Fishing Safety project has been in place 12 years, during which time drowning fatalities have reduced to less than one per annum. The annual project survey report, authored by Auckland University researcher and Drowning Prevention Auckland Board Member Dr Kevin Moran, offers an insight on to the impact of this collaborative intervention. During the 2016-2017 season, 211 rock-fishers were interviewed on their thoughts and habits around rock-fishing risks and precautions. It showed that 24% of those interviewed didn’t “often” or “always” use a lifejacket on the rocks, with no change from 2016 (24%), but dramatically down on the 40% in 2015. This is of concern. Positively, there was almost a four-fold increase in fishers sometimes wearing a lifejacket, (41%, 2017; 11%, 2016), and fishers reporting they never wore a lifejacket dropped by almost 50% (37%, 2017; 65%, 2016). Read Dr Moran’s 2017 report. Wear a lifejacket – this offers the best chance of survival should you fall in the water. Wear light, warm clothing and sport shoes – not gumboots. Check the swell, weather and tide forecast before choosing your fishing location. Avoid getting cut off by an incoming tide, plan an escape route. Keep your eyes on the sea, be prepared to climb to safety. Fish with someone who has fishing experience and knows the site well. Follow the advice of safety signs and warnings. Know who and how to get help in an emergency, carry a mobile, call 111. Call 111 for police, report your location and emergency. Send someone to find help, a lifeguard.